Getting ready to leave mainland China now, about to head off for Hong Kong. From Xi’an we headed down to Huang Shan and then onto Shanghai and finally back here, to Beijing. Huang Shan was beautiful, said to be the most well known mountain range in China, the ‘Mt. Fuji’ of China. The scenery was amazing, we stayed in a little hostel full of Chinese tourists. 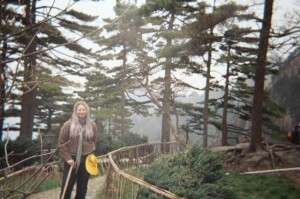 On our second day in Huang Shan we jumped on a minibus and headed off for the mountains. Turns out our hostel booked us in for a Chinese tour group, we all got yellow hats and little badges and walking sticks. We have seen these tour groups all over China, little groups of people wearing matching hats traipsing around the tourist spots. Anyway, finally ended up at the mountains, and off we went. Tash and I decided we didn’t want to walk to the top (a 3 hour hike), so we took the cable car up. Our guide freaked, convinced he was going to lose foreigners in the mountains and found some other people to babysit us while we waited for the cable car. Once at the top we hiked around for about 5 hours. The scenery was awesome, the hike wasn’t too tough, or so we thought. Whilst we were up the top we saw a total of 3 foreigners, everyone else was Chinese. And what a lot of Chinese, I’d say about 10,000 people, all in red hat and yellow hat and blue flag and green flag tour groups! Although we started off taking photo’s of the beautiful scenery, we ended up taking photo’s of the thousands of Chinese people taking photo’s of us!!! Finally it was time to go, our guide pulled us aside and asked if we wanted to take the cable car down, or walk. Well, stupid us decided that since it was all downhill anyway, we’d be fine. Over 9km of steep steps going STRAIGHT down the mountain… We basically fell down the mountain, our legs were jelly, and I’m not sure that our knees will ever be the same. [My legs are still extremely sore, that was a week ago.] We stumbled into our hostel that night, everyone just laughed at the silly foreigners – there were grannies doing the walk who seemed to be power steaming ahead! The next day we took off to Shanghai, what an amazing difference. Shanghai is truly a destination for foreigners – upon arriving we ran into 3 separate groups of Aussies, almost more than we’ve seen in the past 2 months! Our days in Shanghai were basically spent sleeping and shopping, the nights reserved for the clubs. Clubs were good, met a lot of interesting people, a lot of people from Germany, surprisingly. Beers are expensive in Shanghai though, we were paying the same as what you would back home, bit of a shock! We tasted the foods – I tried stir fried bull frog, very tasty, if not a little difficult to eat. Shopping was good, Shanghai has a great selection of pearls, not exactly what a backpacker needs, but exactly what a backpacker wants!!! We stayed at the ‘Captain Hostel’, where all the staff were dressed as sailors, very full on. Our bar overlooked the city and the river, which made it a nice place to wind down after a tiring day shopping. Oh yeh, on our second day in Shanghai Tash and I took out my hair – I’m now blonde again, no longer have purple plaits down to my waist. It took us 3 hours to get out, and my hair has never been so frizzy and knotty in my life! Starting to get back to normal now. Now we’re just chilling, doing our traditional ‘end-of-country’ shopping, we’ve been picking up some great bargains, mainly because we’ve finally got the bargaining thing downpat. Next stop – Hong Kong, should be fantastic!